Understand the exact dose and timing of each medication. Check the information with your pharmacist when you have the prescription filled. Follow the schedule exactly, and take the exact dosage prescribed by your doctor. Don’t change the dose (take more or less of the medicine) without checking with your doctor. Use a weekly or daily pill organizer – especially when taking several different medications – to help ensure that you get the right dose at the right time. 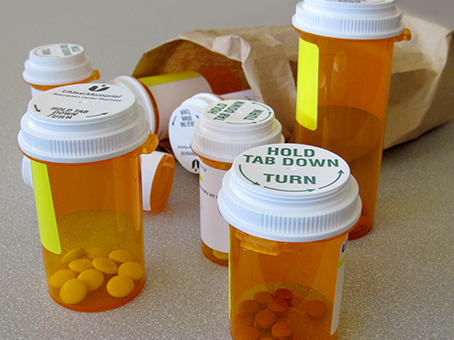 Keep medications in their original containers – except for those you put in an organizer. The labels contain important information such as medication name, dosage, doctor’s name and expiration date. Don’t take medication in the dark, when you’re tired or when you’re distracted. You might take the wrong medication or too much. Ask for help, if needed, to find and take the correct medication. When children or grandchildren are around, keep medication containers out of reach, especially those that do not have childproof caps. If your doctor has told you to stop using a medication, get rid of it immediately. (See below for disposal recommendations.) Don’t keep it for future needs. The cost of having side effects or a drug interaction if you accidently take that medication would be greater than the cost of the medication. Get rid of a medication once the expiration date has passed. Always inquire at your pharmacy about any medication take back programs in your city. If one isn’t available, follow any specific disposal instructions on the drug label or patient information that comes with the medication. If no instructions are given, crush and mix medications with coffee grounds, cat litter or food scraps. Seal them in a bag or a container (such as a margarine tub or jar) and discard them in the regular trash. There are some medications that are harmful and could be fatal if accidently taken by children or anyone else. Never stop taking a medication on your own – always get your doctor’s guidance. Some medications must be stopped gradually to avoid complications. If the medication is making you feel sick or causing side effects that you find hard to tolerate, talk to your doctor about adjusting the dose or changing the medication. ← Take a Pass on Annual Pelvic Exams?